A man with a history of violence summoned for questioning by Belgian police went on a rampage Tuesday at a central square filled with holiday shoppers. Identified as 33-year-old Nordine Amrani, he tossed three grenades into the crowd and opened fire. Those killed were two boys, ages 15 and 17, a 75-year-old woman, and an 18-month-old child who died Tuesday evening in the hospital and 122 were wounded. The shooter died on the scene -unclear if it was suicide or accident - in the act that was not related to terrorism. The Place Saint-Lambert and nearby Place du Marche host Liege's annual Christmas market features 200 shops and attracts some 1.5 million visitors a year. In other recent European attacks, a deadly shooting Tuesday in Italy occurred when a man opened fire in an outdoor market in Florence, killing two Senegalese vendors. The gunman then killed himself. 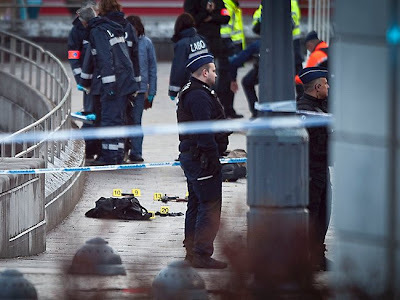 In Norway last July, a far-right extremist went on a bomb and shooting spree that killed 77 people in Oslo.